The Windows Phone 8X is boasting an 8 MP camera, which HTC is keen to promote to users as among the most feature rich around. It's capable of producing stills with a resolution of 3264 x 2448 pixels and has a single LED flash to assist it in low light conditions. To further improve the low-light capabilities the HTC Windows Phone 8X offers a back-side illuminated sensor, which captures more light and a bright f/2.0 lens. For comparison the iPhone 5 and most of the other high-end smartphones offer a maximum aperture of f/2.4. HTC markets the Windows Phone 8X camera lens as 28mm wide (in 35mm equivalent) but we found it to be even wider. When put side by side with an Olympus Micro Four Thirds camera using a 14mm lens (28mm in 35mm equivalent), the HTC Windows Phone 8X is able to fit a lot more in the frame. The camera UI is pretty simple - you have your viewfinder and some controls on the right. From top to bottom they are the still/video camera toggle, virtual zoom buttons and an extended settings menu. On the left you have an arrow that takes you to the images taken with the camera, alternatively you can do a swipe gesture too. The camera app on Windows Phone offers extensive settings, ranging from scenes and effects to white balance, contrast, saturation, sharpness, ISO and more. You have a dedicated Macro focus mode but no face detection. The flash can be set to auto, forced or off. The camera key will wake the phone with a single press - that is unlocking it, and start taking shots. Sadly, the HTC Windows Phone 8X doesn't do all that great when it comes to image quality. The camera is usually able to get the exposure right and has good contrast and dynamic range, but the amount of detail it captures is average and the noise levels are fairly high. This look a bit better in dimmer environments and the HTC Windows Phone 8X is able to climb up the pecking order in such conditions, but you shouldn't expect miracles. Macro shooting is another thing. The Windows Phone 8X can get really close and produces good results with impressive detail and really fast focusing. The physical shutter is a joy to use and is really improves the overall experience. We expected the Windows Phone 8X to be on par with the One X and it pretty much delivered. There are many similarities between the two cameras from processing to the amount of captured detail. The HTC Windows Phone 8X enters our photo comparison tool, where you are free to compare it to any of the smartphones in our data base - the tool's page will give you information on what to watch out for. The video camera interface is identical to the still camera one and has plenty of features too. You can change the white balance, sharpness and the video resolution among other things. The LED flash can be made to work as a video light, too. 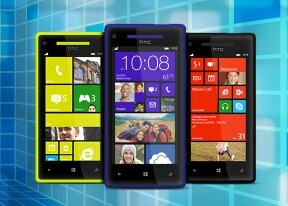 The HTC Windows Phone 8X shoots 1080p and 720p videos. In terms of detail we are pleased and focusing during video capture was overall snappy. But it's the automatic exposure that isn't up to scratch here. The Windows Phone 8X had trouble deciding what exposure to select and often times disregarded the bright sky resulting in blown up skylights and underexposed objects below it. Otherwise the videos are smooth and look especially good on the 4.3" screen of the Windows Phone 8X. Bitrate for the 1080p video was a steady 21 Mbps while the framerate hovered around the 29 fps mark. Audio is recorded in mono, which is rather disappointing, given that the smartphone has two microphones. With 720p videos the bitrate fell to around 15 Mbps with the same 29 fps framerate. Audio is still mono with the same 100 kbps bitrate and 44 kHz sampling rate. You can also download an untouched 1080p@30fps and 720p@30fps video sample. The HTC Windows Phone 8X is ready to bump heads with the likes of the HTC One X and Samsung's Ativ S in our video quality comparison tool. Once again you should consult the tool's page for information on what to look out for.